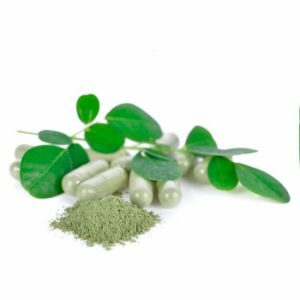 The leaves of the moringa tree (sometimes called the Ben oil tree) are a source of important antioxidants and other beneficial compounds that could help address many modern illnesses, according to a recent review. The moringa oleifera (MO) tree is native to the southern foothills of the Himalayas in northwestern India, and widely cultivated in tropical and subtropical areas where its young seed pods and leaves are consumed as a vegetable. It is usually the leaves that are used medicinally but other parts such as the bark, sap, roots, seeds and flowers of the plant may have protective effects against a plethora of chronic diseases, researchers have detailed in a new review. The seeds also yield a useful oil which is used in cosmetics. Laboratory analysis has found that the leaves contain a variety of bioactive components, such as vitamins, flavonoids, phenolic acids, tannins, saponins and isothiocyanates, which could account for the health claims for the plant. These components are said to be effective against diabetes, Alzheimer’s, Parkinson’s, hypertension, heart disease, and non-alcoholic fatty liver disease, cancer, and general inflammation. Though there are no large scale studies to substantiate such claims, there are more than 1000 smaller studies which give an indication of the plant’s potential. » The moringa oleifera tree has been cultivated for thousands of years as a food and medicine. » While no large scale human trials exist to show its medicinal benefits, more than 100 studies in the laboratory and in animals suggest that antioxidants and other components found in the leaves are medicinal. » Researchers pooling this data have found encouraging evidence for the plant’s ability to lower cholesterol and blood pressure, to fight diabetes and to improve cognitive health. To investigate more, researchers at the University of Connecticut and Mexico’s Universidad Autonoma de Sinaloa reviewed and pooled together smaller studies on moringa’s ability to prevent and alleviate some of these chronic conditions. Their findings are published in the journal Antioxidants. The researchers found hypolipidaemic (cholesterol lowering) effects, with the research suggesting flavonoids and phenolic compounds were shown to aid in regulating lipids, delaying cholesterol absorption, and decreasing plasma cholesterol concentrations. This was offset by “enhanced bile acid synthesis from cholesterol in the liver,”​ resulting in lower overall cholesterol levels in the blood. The leaves’ methanol extract, on the other hand, was found to ameliorate drug-induced liver and kidney damage. In guinea pigs, they prevented non-alcoholic fatty liver disease “in a model of hepatic steatosis, as measured by lower concentrations of hepatic cholesterol and triglycerides”​. Apart from reducing cholesterol and protecting against non-alcoholic fatty liver disease, moringa leaves also lowered blood pressure in rats. The researchers said this was likely via a “calcium antagonist effect”, which has been shown to help treat high blood pressure. Calcium antagonists (such as conventional calcium channel blockers) lower blood pressure by preventing calcium from entering cells of the heart and blood vessel walls. In addition, they referred to a recent study that had reported moringa’s reductive effect on vascular oxidation in hypertensive rats. Moringa’s anti-diabetic effects appear to be related to its isothiocyanates – sulphur-containing compounds also found in cruciferous vegetables – which lowered insulin resistance, while its antioxidant flavonoids and phenolic acids were said to increase insulin sensitivity. Moringa has also been shown to influence carbohydrate metabolism by restoring beta-cell function and integrity, “increasing insulin activity, (and) improving glucose uptake and utilisation.” Beta-cells are major hormone secreting cells in the pancreas. Additionally, several studies have documented moringa leaves’ ability to protect cells from oxidative DNA damage linked to cancer and degenerative diseases. One such study reported that moringa leaves inhibited “the viability of acute myeloid leukaemia, acute lymphoblastic leukaemia and hepatocellular carcinoma cells,” attributing this quality to several bioactive compounds. Moringa leaf extract was also shown to contain the growth of breast and pancreatic cancer cells, as well as to increase the efficacy of chemotherapy. Moringa was also shown to be able to enhance memory, as well as prevent oxidative stress in Alzheimer’s disease; it was found to alter brain monoamines and electrical patterns in rats. Furthermore, in a mouse model of Parkinson’s disease, a bioactive compound in moringa was shown to stem from a process known as myrosinase hydrolysis, which helps reduce inflammation and cell death, as well as oxidative stress. Overall, the collective research suggests that moringa leaves are a potentially valuable source of herbal healing. Most of this research has been in the laboratory and in animals however, and human studies would be most welcome to confirm these effects. ​In 2008 the National Institutes of Health named Moringa the “Botanical of the Year” in celebration of Earth Day. That’s because in addition to being a source of nutrition and potential healer it is also an environmentally valuable plant which grows in poor soil and drought conditions. ​It is already considered a ‘superfood’ by some and powders, supplements and teas of moringa can be purchased in most health shops. The powder has a slightly spicy flavour, said to be somewhere between horseradish and asparagus, which makes it suitable for inclusion in green smoothies and soups. Try taking ½ to 1 tsp daily.